The JT30 Roadhouse Harmonica Microphone is an exclusive version of this Astatic by Hohner hand-held mic with volume control. The JT30 Roadhouse Microphone produces that classic, dirty Chicago blues harp tone. 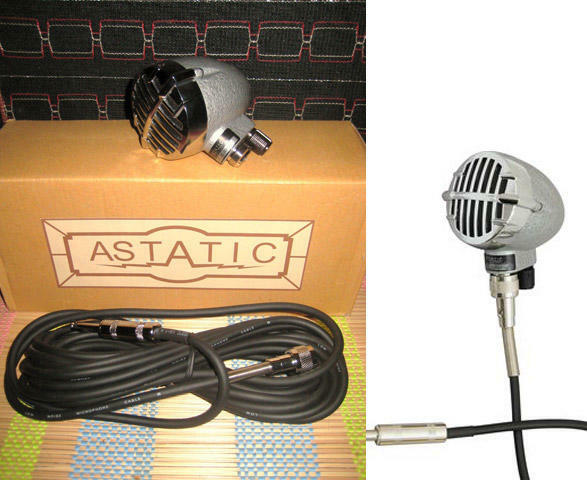 The Astatic JT30 was introduced over 50 years ago as an inexpensive and rugged crystal element microphone for public address systems and Ham radio operators. Blues players discovered that the Astatic JT30's emphasis of the voice's midrange frequencies produced a raw, honkin' sound when they cupped their harmonica against broad front of this bullet microphone. Over the years, the JT30 has become the favorite harp mic for many established blue harpists. The JT30 Roadhouse uses the same mold for the mic housing that Astatic used to build the original JT30 mics. When played through a vintage-style tube amp, the frequency response of the JT30's crystal element duplicates the warm, slightly distorted "Mississippi Sax" tone that harp players crave. Includes 20' cable with XLR female connection designed to fit the threads of the JT30 and a 1/4" male adapter that plugs directly into a guitar amp. This is a great harmonica microphone to buy for yourself or as a harmonica gift. Pull out your best key harmonica and wail dem blues, there ain't nottin' like it! Doesn't matter if it's a cheap harmonica or a gold plated one, your gonna rock this mic!